Jamal has over seven years of experience as a software engineer, and joined RCSG in 2015. Prior to joining Red Cedar, he worked on C#/SQL based applications for the State of Michigan’s Judicial Information Systems branch. Jamal studied C#/C++ programming languages at Westwood College, where he earned a Bachelor of Science degree in Software Development. He later returned to school and earned an MBA in Information Technology Management. 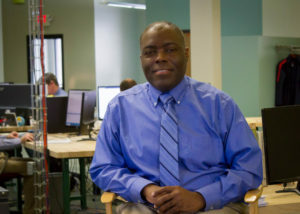 In addition to software development, Jamal has a strong interest in PC hardware. He holds both CompTIA A+ and Net+ certifications. Jamal also has a passion for all things aviation. In his spare time he enjoys flying General Aviation Single Engine Aircraft. He has experience flying PA28 types of aircraft which includes the Archer, Warrior and Cherokee 140. He currently holds a Private Pilot Certificate. When he is not flying real aircraft he enjoys flight simulators and learning the complex systems of the Boeing 777/767/737, and Airbus A320 types of aircraft.